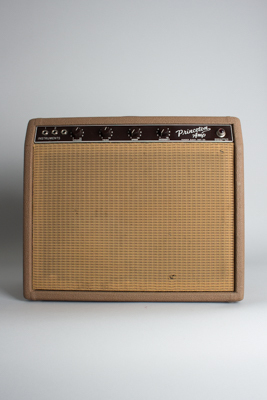 Fender Princeton 6G2 Model Tube Amplifier (1961), made in Fullerton, California, serial # P01314, brown tolex covering finish. This is a beautiful original example of one of our favorite amps -- the "brownface" Fender Princeton-with one somewhat inexplicable anomaly. There is a third input on the face, just to the inside of the two expected ones. It is not labelled on the faceplate; we initially assumed it had been added but when the amp was opened up and examined internally the part is absolutely consistent with the others, and the associated wiring appears absolutely factory spec. We cannot say for sure if this was a one-off employee model, a circuit modification for experimental purposes or just some sort of error, but there it is, a third eye on the face of God's amp. Apart from this the amp appears a stock 1961-2 Princeton. The re-designed Tolex-covered amps of this period were Fender's re-engineered line for the early 1960s, a new standard in power, design and function. Standing between the earlier rampaging tweed era and the louder or somewhat cleaner blackface amps that followed, the "brown" amps have some of the tonal characteristics of both. The tremolo is lush and deep, and the sound starts breaking up just at the perfect volume point for small gigs and recording purposes. The faceplate layout is simple, with-normally-two inputs, tone, volume, and trem speed and depth controls-this one of course has the mysterious third input. Both transformers are dated the 46th week of 1961; the amp looks to have been assembled late that year or early in 1962, though the tube chart stamp is smeared into illegibility. This remains as cool an amp as was ever made; simple, and to many players in this less-loud age the perfect combination of tone and portability. We don't know the story behind this one's minor mutation, but hey it sounds great and you can plug the accordion player in too! Height is 16 1/2 in. (41.9 cm. ), 19 in. (48.3 cm.) width, and 9 1/4 in. (23.5 cm.) deep. This is a very clean and original amp overall; with of course the possible exception of the unusual third input this Princeton appears to have survived the decades without too much use and very little alteration. The handle is a modern repro, but all other major components remain original. The grill cloth has a couple of very small tears and the top straps a bit of corrosion but the Tolex and other components are very well preserved. The amp has recently had a maintenance check with a three-prong cord added, a couple of cathode bypass capacitors and other leaky caps replaced and the amp checked out to original spec. It looked to have never been worked on before and this little brown beast sounds better than ever now! The original "Fender Custom Design" Oxford speaker is not a particularly robust model (this was considered a student amp when new). While it sounds great at most volumes if this amp is going to be constantly cranked to "10" we'd suggest a more heavy-duty replacement. Whatever the story behind it this is cool and slightly weird little Princeton, definitely the only one like it we have ever seen. Excellent - Condition.